In 2014 there were a lot of interesting facts and important milestones for the most important social media networks: LinkedIn has reached 300 million registered users (April 2014), Facebook reached 1.35 billion monthly active users (September 2014), Instagram hits 300 million monthly users (December 2014) and so on. 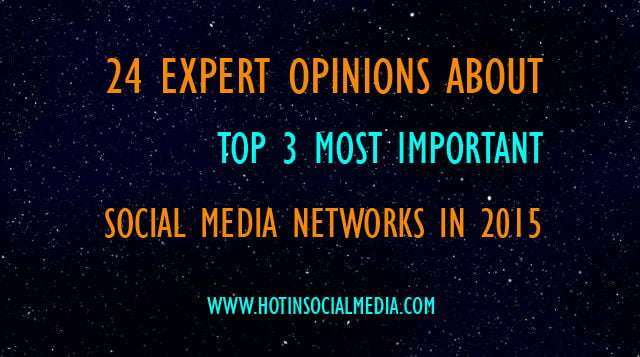 One of the big questions at the start of the new year for all the internet users (marketing and social media enthusiasts in particular) is: Which are the 3 most important social media networks in 2015? 24 of the well known social media experts have answered this question for our Hot in Social Media audience and you can read their answers below. Which are the 3 most important social media networks in 2015? Answer: Twitter and LinkedIn will remain 2 of the 3 most important social networks in 2015, but Facebook will eventually be replaced by Instagram. It won’t happen in 2015, but over the course of time, Facebook will begin to lose its grip on the youngest members of the internet population, who are starting to shift over to Instagram. Again, Facebook doesn’t have anything to worry about in the immediate future, but I think it will be difficult for them to continue to hold their grip on so much of the traffic on the web. Answer: There really is not a blanket answer here. Every business and/or professional is different, so each should have their own “most important” target platforms. First and foremost, a blog where you publish niche information should be the social hub — When the blog stops, online marketing results slow. And, LinkedIn is a given for every professional as their professional home base. 1. Facebook Groups: Because most people are already on Facebook in some way – Some never log out. Facebook Pages have become challenging in a handful of ways. Facebook Groups offer a place where people of like interest gather, and due to that, are more likely to interact. Group members will also tend to eventually open up, and the exchange becomes more intimate. Facebook Groups posts also make it into the news feed with more predictability than from Facebook Pages. It should not really be an either/or, but a set of companion marketing tools. 2. Instagram: Because it is visual and mobile – Always in our back pockets. It is not yet over-crowded, so it is easy to make valuable connections – both personal and business. You can also re-post Instagram content to your social networks to add self-created visual content to your social media streams. Plus, it is just plain fun! 3. Video: Just use it! Whether YouTube, Vimeo, Instagram, Vine, or organically uploaded from your mobile phone – Connecting with your audience in a real, authentic and visual way is ever more important. Those that do this will soar ahead of their competitors. Video is the ultimate attractor and ignitor – Like Red Bull for social. Answer: Facebook, LinkedIn and Twitter. These are the biggest and most used, and together their strengths overcome each others’ weaknesses. There are other great platforms that help you reach niche audiences, like Instagram, Pinterest and Reddit- but most companies would make these their 4th, 5th and 6th choices- and some of them do not have advertising, which is critical for scaling your marketing reach and results. Answer: Niche sites will prove to be very valuable for many businesses. But if I have to name three, I’m putting my money on Instagram for community building, G+ for search benefits and Twitter for customer support. Answer: Facebook and Twitter have been wildly popular for the last several years and I think will continue to be important in 2014. But I think Instagram will be the sandbox of choice for many people this year. Instagram a fun play to play…. is simple, it’s effective, and there are millions of users that are highly active daily. Businesses have a huge opportunity to take advantage of Instagram in 2015. December 2014 Instagram announced there are now 300 Million Users! Answer: Facebook, Twitter and Instagram… Facebook owns the audience and provides the most relevant data and connection, Twitter is real-time and is all about communication, and Instagram is about images which is the easiest to produce and to connect with. Answer: YouTube is currently experiencing a second wave of growth and this is coming in the form of semi-professional content creation. Very strong, inter-connected communities are forming around online personalities and many of these uniquely influential micro-celebrities are centered around YouTube as a platform. Instagram is another platform to watch. It is currently experiencing staggering growth, and has the monetary backing of Facebook to help propel its growth even further. Brands have already started figuring out how to monetize Instagram and 2015 will see even more brands embrace Instagram as a monetarily viable network. Snapchat was already hyped a lot in 2014 and I believe that much of this excitement was merited. Not only has Snapchat created their own social networking niche, but they have spent the last year improving their core product as well as introducing new offshoots that show a great deal of promise such as SnapCash. Answer: The 3 most important social media networks in 2015 will be Pinterest, Google+ and Facebook. The reason is, so much going on in our daily tasks online we need to use more services that will keep our post visible for longer periods of time. Pinterest can get engagement weeks or more after you shared your image. Google+ has a high quality of traffic and using Communities effectively can get plenty of engagement from your shares. Facebook is the wild card! I’m sure most of you have heard about the changes Facebook is making to Groups and Pages. The reason I say Facebook is the wild card is because if you have been effectively using Facebook for an extended period of time, you should still do well. If you are just starting to use it or have not been using it long, you can still get a lot of benefits. Just be prepared to put in the work and the time! Answer: For my business the most important social networks are Twitter, Google+ and Facebook. They are the networks that have been driving the best results in terms of social traction. But the truth is that it all depends on who your audience is and the results you get from each network as to which social networks will be most important. In 2015 I’ll be focusing more on the likes of LinkedIn and less on Facebook, mainly due to the benefits of LinkedIn publishing. Answer: Which social media networks are important depends on your industry. For instance product based businesses should focus on Pinterest, Instagram and YouTube because they give a rich visual experience while service based industries should focus on Twitter, Youtube and Facebook since these allow for more discussion and the ability to give actionable results. Answer: Without a doubt, Instagram is going to continue to rise as businesses, even B2B companies figure out how to leverage it to tell their stories and connect with their audience. I think 2015 is the year that Google + either makes it or breaks it. I do think that Facebook, particularly Groups and advertising remain strong. Answer: Twitter will surely be one of the networks where users will shift; I expect it to grow in importance as an online marketing channel, especially considering the amount of new products they’ve been releasing in the past months (animated gifs integrations, new cards, advertising available in new markets, native retargeting, etc…). Answer: Being a blogger myself, I consider Twitter to be number one. It’s just the fastest, most concentrated network there is. It’s simply the best way to connect with others who share my various interests (via separate accounts) and thereby develop meaningful online relationships, build authority, and draw traffic to my blogs. I value Google Plus also. It’s great for building traffic and authority, of course. But the way it incorporates so many different strands of Google’s empire makes it even more useful. Having some niche websites with a local focus, I can create pages for them along with dedicated YouTube channels, for example. There are just so many advantages to being active on this network — with more to come, no doubt. I also enjoy using Linkedin. As well as it having many great people to connect with, the groups in particular can be a good source of blog traffic. Then there’s the publishing tool, which is perhaps the quickest way to build authority among influencers there is. Answer: I still believe in the power of Facebook just in terms of sheer scale and targetability. There is no other one platform that allows a marketer to reach their particular audience in such large numbers and in such a compelling and interactive way. Plus, it owns and maximizes content from Instagram which is a huge benefit as well. From there, I think Pinterest with its high engagement and ROI. It will be interesting to see how it evolves into an ecommerce platform as it continues to encourage consumer purchase and I look forward to seeing how they continue to expand amongst a male audience. Last, I think Snapchat is doing some innovative things and they certainly have captured the younger target audiences. Answer: “You are your Google search,” and for that reason I feel LinkedIn will be one of the more important social media networks in 2015, particularly for sales reps and college students looking for post grad employment. Twitter is going to remain an important platform for both individuals and businesses who want to connect with prospects or partners and I’m also a big fan of producing video content to tell stories so you know I have to add YouTube into the mix. Answer: This part is tricky. My bet would be Twitter, Google+ and LinkedIn. With tweets being indexed by search engines, people are going to flock back into Twitter. There’s no two-ways in this. Google+ is a twin-edge blade as when Google killed authorship, it basically ranks Google+ on par with any social media platforms out there. However, because it is Google, they are good to make Google+ on the top in no time. Lastly, LinkedIn is already the king in B2B and it will grow even bigger in 2015. Facebook At Work just shows how important it is for social media platforms to take a deeper stand in the business community … which LinkedIn been mastering for years. If you want success in 2015, get involved in LinkedIn — right now! Answer: Instagram, Pinterest, carefully selected social sites that work best with your audience on behalf of your business. Answer: I see Instagram, Pinterest, and LinkedIn continue to play major roles in the social media sphere. The first two because they are all about visual content. People pictures, short videos, and infographics! As average attention spans grow shorter, tidbits of targeted, useful, and entertaining information will have a greater impact than text. Now, why LinkedIn? Because of its publishing platform, which allows all members to share their insights and expertise with peers and get valuable exposure in the process. Answer: I would have to say that the 3 most important social networks would have to be the biggest 3 – Facebook, Twitter and LinkedIn. They are almost too big to fail now. This choice would obvisously change from person to person and business to business, depending on the perceived value of the social network towards one’s own personal goals and objectives. For instance, a freelance photographer might argue that Instagram and Pinterest are more important to them than Twitter and Facebook, whereas an accountant might value LinkedIn as his most important social network. Answer: Facebook will continue to remain the “top-dawg” social network for obvious reasons. After that, Instagram. No business or brand can ignore the engagement potential of that social network. Instagram may be more of a challenge for some, but a little visual creativity can pay “social” dividends on the platform. Lastly, YouTube. Video is (and has been) a crucial piece of any social media marketing strategy. We’ve been saying that for a few years, but 2014 brought with it video smartphone apps (Vine, Instagram, etc) allowing people to easily record and share their experiences online. Answer: Instagram: Focus is shifting to visual networks. Facebook: Even though marketers are as frustrated as ever with it, there’s still a large number of consumers there and brands will need to sharpen their Facebook ads skills. Twitter: It will continue to be one of the best networks for one on one engagement with consumers which will be critical in 2015.